The moment of truth is here! The first Ghostbusters trailer has arrived. The footage was previewed yesterday by director Paul Feig, with the teaser shown off to a select group of fans. The sneak peek was met with a standing ovation, with stars Kristen Wiig, Melissa McCarthy, Leslie Jones and Kate McKinnon all championed as the new team of spirit chasers. Following the warm reception, the director told the crowd he was thrilled by their response. "I'm relieved for the moment, before it's released to the world. I'm confident. Ghostbusters are for everybody. The first movie worked because it had four of the funniest people and I just want the funniest people - and the funniest people are these women." Also in attendance at the special event was screenwriter Katie Dippold, who previously worked with Paul Feig on the hit action comedy The Heat starring Sandra Bullock and Melissa McCarthy. She was also surprised and happy by the response the footage got. About the movie, she explains that it is all-inclusive. "This is a story, if you placed men in those characters, you could do it. It's pretty genderless." The story centers on Erin Gilbert (Kristen Wiig) and Abby Yates (Melissa McCarthy), who, years ago, wrote a book that posited ghosts do in fact exist. The plot picks up with Erin acquiring a teaching position at the prestigious Columbia University, but she is laughed out of academia once word of her book surfaces. At the same time, Abby is working with a new partner, Jillian Holtzman (Kate McKinnon), just as a new slew of ghosts begin to invade New York City. Erin ends up joining forces with Abby and Jillian, along with a new partner Patty (Leslie Jones), to save the Big Apple from these ghosts. Kristen Wiig had this to say about her character. "Someone had created a device that has amplified paranormal activity and we might be the only ones who can stop it." Fans of the original can expect a few big surprises. Slimer will be back for a cameo. 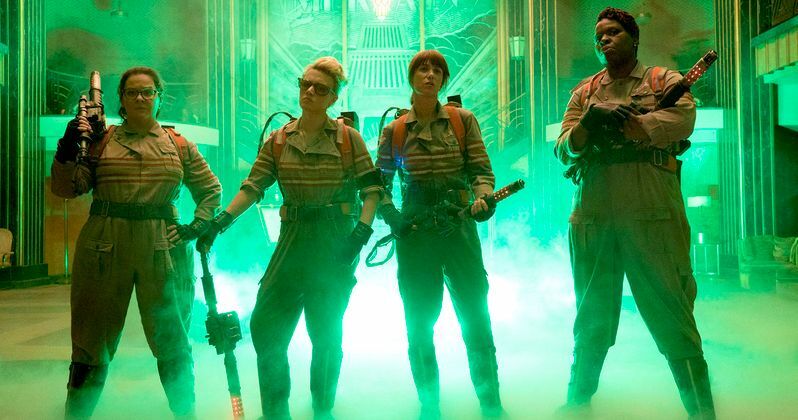 And there will be a new version of the Ghostbusters theme, which you can hear in this trailer. Composer Theodore Shapiro is also composing his own brand new theme. Original Ghostbusters director Ivan Reitman is producing alongside Dan Aykroyd. The supporting cast includes Chris Hemsworth as the male secretary Kevin, Andy Garcia as the mayor of New York City, Michael K. Williams as Hawkins, Matt Walsh as Rourke, Pat Kiernan as a news anchor and Neil Casey as the human villain. Bill Murray, Dan Aykroyd, Sigourney Weaver, Annie Potts and Ernie Hudson have all been confirmed for cameo appearances. Take a look and let us know what you think? Is this who you're gonna call this summer?